Greenfield/Belser of Washington D.C. is a brand design firm that prides itself on telling clients’ stories in a unique and clever fashion. The story telling takes many forms for it’s professional services clients…videos, brochures, annual reports, and websites. One of the company’s areas of expertise is branding and selling law firms, which is no easy task. Greenfield/Belser was one of the first to breakdown the staid barriers of legal promotion in the 1980’s, “tossing out the images of fluted columns and scales-of justice”. 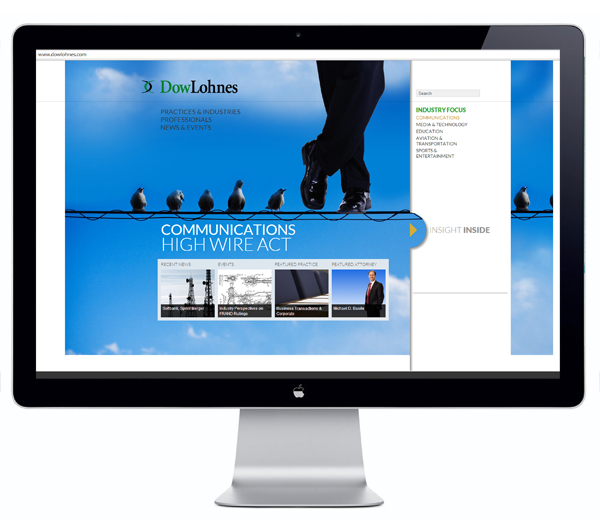 It’s award winning entry is a website for the DowLohnes law firm. Creative and refreshing are usually not the words associated with a law firm, but the DowLohnes website is both, plus some. The home page, eye catching and smartly designed, smoothly leads visitors to other portals. Dowlohnes offers a host of legal services ranging from communications to entertainment and the website lays them out in a logical and easy to follow manner. The website blends sharp graphics, friendly photographs, and concise text to tell the firm’s story. After navigating through the pages, a visitor feels that he not only knows these lawyers and understands what they do, but likes them!